In the tradition of Bruce Lee, Jackie Chan and the Three Stooges comes this wildly funny action comedy from director Steve Wang. When chased by mutated monsters, crafty ninjas and a 300 foot tall stone god, the bumbling heroes battle against the powers of darkness in search of "The Power Most Big". 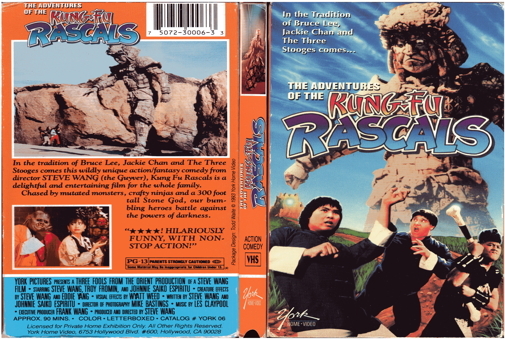 In the tradition of Bruce Lee, Jackie Chan, and The Three Stooges comes this wildly unique action/fantasy comedy from Steve Wang (The Guyver), Kung Fu Rascals is a delightful and entertaining film for the whole fsmily. Chased by mutated monsters, crafty ninjas, and a 300 foot tall Stone God, our bumbling heroes battle against the powers of darkness.